Oh my goodness, during this crazy time of year I am always thankful for some attainable, budget friendly holiday outfit inspiration. So I'm thrilled to be linking up with these lovely ladies for another installment of Bloggers Who Budget, featuring holiday styles! The holiday look that I am bringing to the table was actually styled by Shelby of Shell B Cheri, a stylist out of D.C. who came to play in my closet one evening last month. She not only helped me see my wardrobe in a new light, but gave me some great ideas for particular pieces that I was having trouble with on my own. For example, this backless Zara frock was easy to style in the heat of the Summer, but I was sad to see it hanging so lonely in my closet during these cold Fall/Winter months. But Shelby encouraged me to pair the very Summery dress with a sequin top for a totally festive look. Stay tuned for more of our styling session creations coming soon! See below: my budget friendly picks for getting this look. What is your go to holiday look? Any unexpected pairings making their way into your outfits lately? I never would have thought to layer like this. Very pretty look. I love how you layered the sequin top! Thanks so much for joining in the Collab! That is so adorable!! I love it and I never would have though to do that with a backless dress. I love this outfit, lady! I would never think to layer my sequin tops under a dress but it's perfection! And I just love how you instantly made mint totally holiday appropriate! Obsessed! What a cute pairing...I simply love this tee–it's so sparkly and fun! I normally don't like shirts under tank tops or dresses, but this is cute! I think it's because the dress almost looks like a jumper. 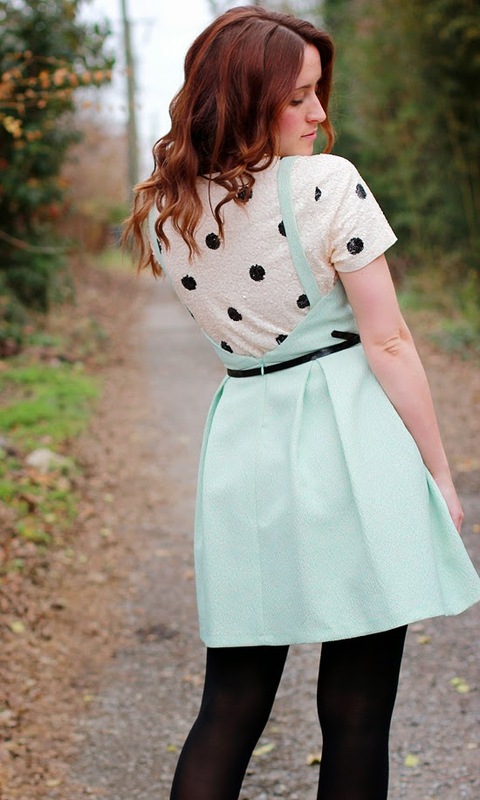 The polka dots and mint color just go perfectly together, especially with your red hair! Love this - you look SO gorgeous lady! that is so cute! i LOVE the polka dots under it! i need to check out those blogs! I can't get over how much I love this outfit pairing!! You look fab! Love this look! Black tights + silver pumps = genius. Pretty! You look great for a holiday party without being to festive! Great styling! i love the mix of polka dots and mint! This minty dress is stunning Jessica! Loving that layering on you! Never would have thought that would look as fab as that does! I love how you layered the sequin shirt underneath a dress! The more I see of this shirt the more I want it!! Love the top! Layering is tricky, and this looks great! Love love this!! You look fabulous. And I love that mint green dress. You look amazing!! I always say how cool it would be to get a pair of new eyes to look into my closet and see what they come up with. It's awesome you actually got to do it! You look so cute. And anything "on a budget" this time of year is welcome! So clever!! So clever!!! I can't wait to see more styles that you ladies came up with!! This is such a fun and whimsical look!! I love your creativity with all of the layering. This is a really pretty holiday look! I'm also having some serious hair envy right now! I love love love your dress!! Perfect color! So cute!!! And I love it with the metallic heels! P.S. I am hosting a Kensie giveaway, hope you will stop by and enter. Love this look, so girly and fun -- and isn't Shelby talented, so great at thinking of combos you wouldn't have thought of! I think this look is beautiful! oh my goodness this is probably one of my favorite outfits of yours, ever! I'm all about stretching summer dresses as far as they can go (it doubles your wardrobe)! The sequins totally add a festive element to this, but the "jumper" look makes it totally sweet. LOVE it. Can't wait to see the other looks you ladies styled! just stumbled upon your blog today and loving it!